English Professor Suba Subbarao’s work in the classroom to help her students, in the words of a colleague, “find their voice and their place” speaks for itself. And now a statewide organization devoted to her passion for developmental education says Subbarao’s place is at the head of the class among her peers. Subbarao, of Rochester Hills, Mich., received the Michigan Developmental Education Consortium’s Educator of the Year award at the state-wide MDEC Conference on Friday, October 19, at Lansing Community College. The nonprofit MEDC serves education by creating a network for educators to research and share best practices, refine strategies for high-quality programs and advocate for developmental education. This fall, Subbarao teaches Academic Literacy II and Composition II online and serves on a committee to develop a new Global Literacy Endorsement at OCC. She also has taught English developmental courses and created an English Boost course, now called English Essentials, that has become a popular course at all five OCC campuses. Subbarao, who has a master’s degree in English, also has taught classes such as Introduction to Shakespeare and Professional Communication. She also developed the first online class at OCC in 1996 and was the only instructor to teach online for the first four years in which such classes were offered at the college. 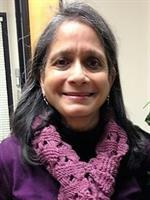 Formerly, Subbarao chaired the English department at the Auburn Hills campus and holds the record for longest-serving chair. Her OCC involvement continues through various committees, “often juggling more than four committees yearly,” Cicilian wrote. Subbarao’s previous honors include outstanding faculty member at the Auburn Hills campus and Outstanding Online Educator, an award presented by the Alliance for Excellence in Online Education. With five campuses in Oakland County, OCC is Michigan’s No. 1 transfer institution, offering nearly 100 degrees and certificates. The College empowers academic and developmental experiences, allowing students to reach their potential and enhance their communities. More than 1 million students have enrolled in the college since it opened in 1965. A seven-person Board of Trustees governs OCC. Board members are elected on a non-partisan, at-large basis, serve as volunteers and are not paid.Learn more at oaklandcc.edu.